New School in Town: How to Lie When Applying for Obamacare! CLASS #101: How to teach your children how to lie! Organizing strategies as seen and heard on the video are showing people how to lie and telling them the Federal government has promised their personal information will NOT be used for anything other than their enrollment in Obamacare. Texas has some of the strictest voting laws in the country. That’s why last year Battleground Texas teamed up with the Texas Democratic Party, county parties, the Wendy R. Davis for Governor campaign and the Democratic National Committee to run a coordinated, statewide Voter Protection Program. 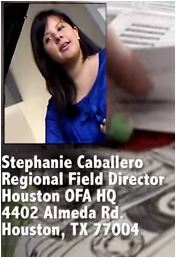 Project Veritas organization produced the video, identified the OFA staffer as Stephanie Caballero. Documents reviewed by Watchdog.org, and included in the video, indicate that Caballero is on the payroll of the Democratic National Committee. To read this article in full and/or all 25 in the series on voter fraud - go here.